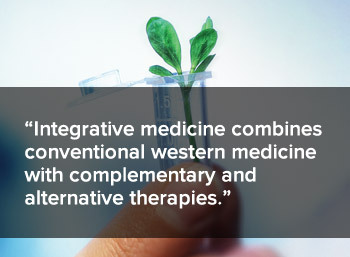 Integrative medicine combines conventional western medicine with complementary and alternative therapies, such as herbal medicine, acupuncture, and stress-reduction techniques. It encourages individuals to question conventional wisdom and consider the (sometimes contrary) clinical evidence of natural therapies. Because this model of care is wellness (not sickness) driven, it empowers people to be active participants in their own healthcare. Historically, mainstream medicine has focused on treating the symptoms that a patient presents, rather than treating the unique individual that is being affected. While this is sometimes a successful mode of treatment, for example, in cases of emergencies, it is often more of a “band-aid” solution that doesn't get to the root of the actual problem. The body is a complex, interwoven structure of different systems. Integrative medicine focuses on the various factors affecting how these systems work together in each person, taking an individualized approach to their treatment plan. It recognizes that what is right for one patient with a certain health history and set of lifestyle factors may not be right for another. The success of integrative medicine is dependent on an open relationship between patients and their healthcare practitioners. In order to treat a patient to the best of their ability, a healthcare professional must know everything they can about the patient's health history, lifestyle, and diet. “Patient-centered care” is an ideology practiced by most integrative healthcare professionals . Patient-centered care is what defines integrative medicine. It's about putting the person first and treating the mind, body, and spirit all at once. Recent changes in healthcare legislation have elevated integrative medicine by creating a renewed focus on the importance of evaluating all of the healthcare options available. In fact, many employers have begun correlating healthcare premiums with the relative wellness of their employees. This new sense of accountability complements the directives of a patient-centered care model. Focuses on the whole person & root cause. Combines Western medicine with complementary therapies. Depends on a patient's willingness to have a strong and open relationship with their healthcare professional. Empowers patients to be proactive participants in their own healthcare.